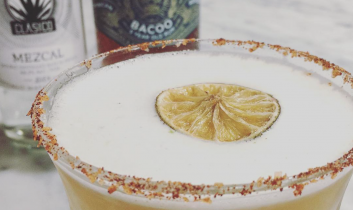 Mezcal is certainly the drink of choice these days and this combination of flavors makes for one smooth cocktail with the egg white providing that foamy, sultry texture to combine with the smoky and sweet flavors. Rim coupe glass with sriracha salt. Shake all ingredients vigorously over ice in large shaker. Pour into coupe glass. Garnish with lime slice.